Here at Angel Publishing, we don’t tell you what to think. But we do pay attention to what the market thinks — and we tell you how to profit from it. Some of you may disagree with the consensus that man-made greenhouse gas emissions are causing unnatural and harmful changes to our climate. And that’s fine. This report is not trying to recruit you to the environmentalist cause. We do need to say this, though: The market clearly believes that climate change is real and worth doing something about. 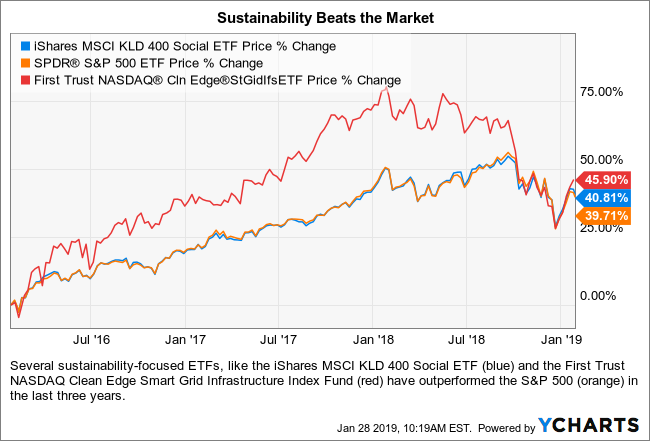 That’s why several sustainability-focused ETFs have outperformed the S&P 500 in recent years. Point being, you may disagree with the science behind the renewable energy investment opportunities discussed below. We’re not asking you to change your views on that. We are, however, asking you to consider this: A majority of investors — and a majority of the policymakers who control the government’s purse strings — believe that climate change is a serious enough threat to warrant big investments in renewable energy. 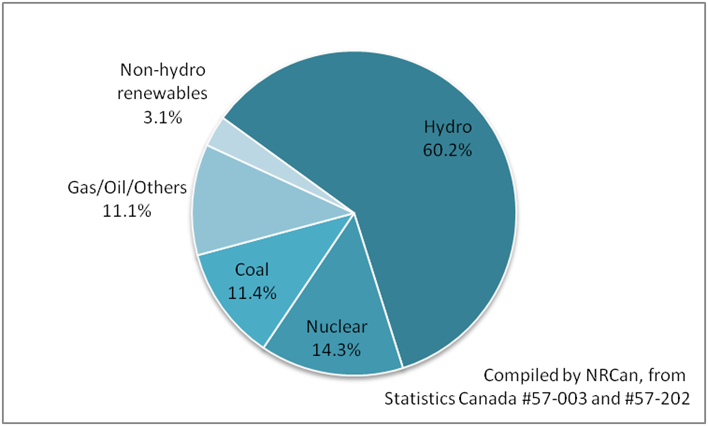 Of course, “renewable energy” is a very broad term. Depending on who you ask, it encompasses everything from wind and solar farms to nuclear power plants to high-capacity batteries. Even natural gas — which isn’t technically a renewable resource — is often lumped in due to its abundance and low carbon footprint compared to other fossil fuels. 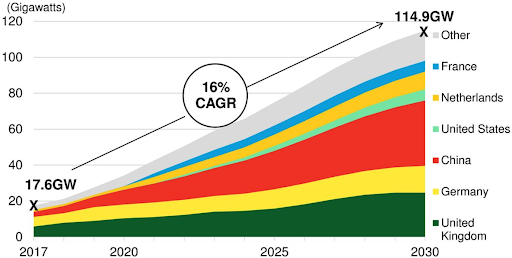 And the investment possibilities under the renewable energy moniker are equally diverse. The space contains companies big and small. Some are growth stocks, others are value stocks. Some are dividend-payers, others are microcaps with massive capital gains potential. In this report, you’ll find some of the top companies from each of these categories. We’ll discuss the technologies that these renewable energy pioneers are working on, their applications, and the financial metrics which make them worth buying. Solar panels might just be the most recognizable symbol for clean energy — and there’s good reason for that. They’re affordable, efficient, and reliable. Unfortunately, China is one of the leading producers of these thin blue squares, and solar panels have played a prominent role in the U.S.-China trade war. The Chinese government heavily subsidized the production of solar panels until last year. These subsidies encouraged Chinese firms to overproduce panels and “dump” them in the U.S., crashing prices and hurting American producers. In response to these practices, President Trump slapped 30% tariffs on all imported panels last year. 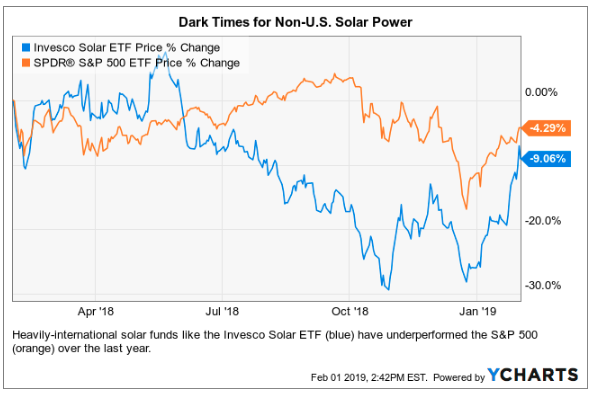 However, there are still plenty of great investment opportunities in solar power, as long as you focus on small- and mid-cap American companies. After all, smaller firms with mostly domestic revenues are insulated from trade conflict. And they’re focused on the lucrative U.S. market for solar panels, which has grown at an average annual rate of 59% over the last decade. Let’s look at two of the best American solar firms. Utilities-focused solar panel manufacturer First Solar (NASDAQ: FSLR) is uniquely well-positioned to ride out the current trade conflict. For one thing, it managed to get all of its imported products exempted from the new solar tariffs. For another, it has an extremely strong balance sheet. First Solar’s assets of $7.12 billion more than triple its liabilities of $1.91 billion. The firm has $2.55 billion in cash on hand and a debt-to-equity ratio of less than 10%. In spite of all the headwinds facing its industry, First Solar has more than doubled its revenue over the last year — and that growth is expected to continue in 2019. SolarEdge (NASDAQ: SEDG) isn’t quite a panel manufacturer. It provides power optimization, DC-to-AC inversion and monitoring services for solar arrays. It’s not a massive business. SolarEdge has a market cap under $2 billion. But the firm does solar power inversion better than anyone else. It held almost half of the global market share for inverters at the end of 2017, and it’s rapidly growing its monitoring and optimization businesses. The firm increased revenue by an impressive 39.26%. And more than half of that revenue came from within the United States. Between its non-panel core business and its domestic focus, SolarEdge is another firm that should make it through this solar panel trade war unscathed. Wind turbines are another universally-recognized symbol of renewable energy — and indeed, wind power is one of the fastest-growing sources. Wind power has an estimated compound annual growth rate (CAGR) of more than 13% per year, and the offshore wind power market is growing even faster. Wind power is also a relatively unsaturated industry compared to other renewables. After all, anyone with a couple thousand dollars to spend can slap a solar panel on their roof. Installing a 320-foot-tall turbine is a little trickier. San Francisco-based Pattern Energy (NASDAQ: PEGI) is one of the largest wind power generators in North America. It’s currently building the Corona Wind Projects farm in New Mexico, which will soon be the largest wind farm on the continent. It also pays an extremely generous dividend for a $2 billion company. At the time of writing, the yield was just under 7.5%. What’s more, the firm is becoming more and more cash flow positive over time. And the firm has never cut its dividend in its five years of operation. Florida-based NextEra Energy (NYSE: NEE) isn’t just one of the world’s largest wind power generators; it’s the world’s largest renewable energy generator. The company owns a vast portfolio of green power plants. Most of them are wind farms, but quite a few of them are solar, nuclear, and natural gas installations. NextEra is so big and successful that it controls its own utility company — Florida Power & Light — and services over five million individual customers. This vertical integration has made NextEra a very reliable dividend stock with a yield of roughly 2.5% at the time of writing. And that yield isn’t going anywhere. The firm has a comfortably low payout ratio; its dividend equals just 31.58% of EPS. It also has no history of dividend cuts. With metrics like these, NextEra could one day become the first green Dividend Aristocrat. Both of the energy sources we’ve covered so far are extremely promising. But there’s one problem with wind and solar power than green energy naysayers are quick to bring up — they’re unreliable. Solar panels don’t do much on overcast days, and wind turbines are useless without wind. If we’re eventually going to run our electric grid on renewable energy sources like these, we’ll need a way to take the excess power produced on sunny or windy days, and store it for use on cloudy or still days. That’s part of the reason why battery technology — especially high-capacity lithium-ion battery technology — has gotten so much investor attention recently. 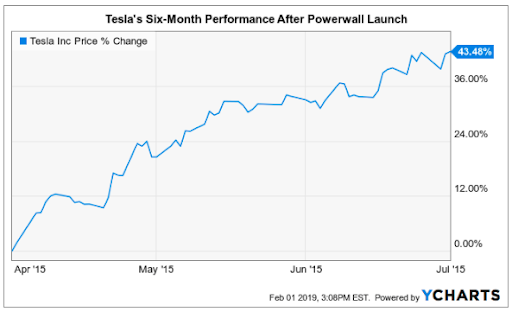 As you can see, Tesla (NASDAQ: TSLA) surged almost 45% in the six months after launching its Powerwall product (a big lithium-ion battery designed to store solar power for home use). Tesla, however, isn’t one of the companies we’ll be profiling here. There are plenty of companies out there which offer purer and more profitable plays on lithium battery technology. Plus, their CEOs are much less likely to make public statements while stoned or tripping on acid. Small-cap mineral miner Westwater Resources (NASDAQ: WWR) used to be called Uranium Resources. It was a prominent provider of nuclear fuel. But a brutal bear market for uranium in the mid 2010s decimated this business, forcing Uranium Resources to pivot to lithium and graphite exploration and change its name to Westwater. Wall Street lost faith in the company, reducing it to a penny stock. In spite of all these obstacles, Westwater Resources has done quite well in its second act. It owns manufacturing facilities which produce high-grade graphite for battery anodes — an increasingly valuable commodity — as well as several lithium mines in the U.S. Southwest. And despite the company’s small size, it’s got some pretty good numbers going for it. The firm has no debt and more than four times as many assets as liabilities. It also grew EPS by 36.41% in the last year. All of these signs point to a comeback for this beaten-down miner. Specialty chemicals processor Albemarle (NYSE: ALB) is a slightly different play on lithium technology. Unlike Westwater Resources, Albemarle doesn’t actually source lithium for batteries — it just processes it into usable forms like lithium carbonate and lithium hydroxide. As a result, it’s less vulnerable to the various commodity market swings and geopolitical risks which can make or break miners. Albemarle is a more “boring” take on battery lithium. In fact, it’s a dividend stock. The firm’s 1.65% yield has never been cut, and it accounts for just 41.75% of earnings. Another green Dividend Aristocrat in the making? Only time will tell. As we discussed in the battery section above, nuclear power has not had a great run over the last decade. 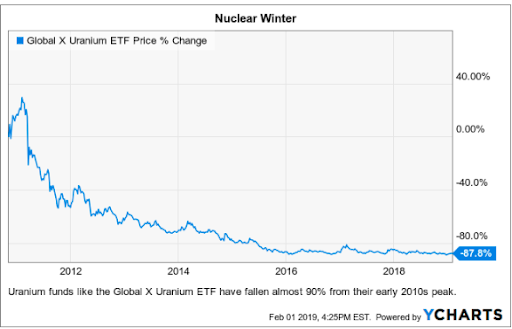 The Global X Uranium ETF (NYSEARCA: URA) is down almost 90% from 10 years ago. Uranium was hit pretty hard by the end of the 2000s-2010s commodity supercycle — the same macroeconomic phenomenon which took a bite out of the oil industry in recent years. A lot of speculators and market commentators left it for dead. And that’s exactly why now is a great time to buy nuclear power stocks. We’re gonna need this reliable, high-output, carbon-free energy source in some way if we want to meet emissions reduction targets. And with a pro-nuclear administration in the White House, things are finally looking up for the industry. Energy Fuels Inc (NYSEAMERICAN: UUUU) is another stock which has unfairly been reduced to a microcap by negative market sentiment. Worth only $265 million, the stock still looks favorable by several metrics. EPS are up 29.79% in the last year, and the firm has maintained a respectable gross profit margin of 60% despite its recent hardships. All four analysts currently covering the stock rate it as a “Buy,” and it’s easy to see why. It’s still more than 20% off its 52-week high — but it has recovered by more than 80% from its 52-week low. Bethesda, Maryland-based Centrus Energy (NYSEAMERICAN: LEU) is an even smaller-cap play on the beaten-down nuclear industry — and it could have even more upside potential. The firm enriches high-grade uranium for next-generation nuclear reactors using advanced centrifuges. It’s currently the only U.S.-based supplier of this kind of enriched nuclear fuel; the rest of the global supply comes from Russia. In other words, Centrus is the only company that can help the U.S. upgrade its nuclear reactors without turning to suppliers from a semi-hostile foreign country (and potentially compromising national security in the process). Centrus is certainly one of the more speculative plays in this report. The company is worth a puny $26 million and has a lot of debt on its balance sheet. However, it’s cash flow positive and has been growing earnings and gross margins over the last year. The firm has also inked several high-profile deals in recent months, including a $100+ million contract with the Department of Energy and an order of undisclosed size from French nuclear operator Orano Cycle. This kind of sales ramp-up indicates that better times are ahead for Centrus. These two renewable energy sources don’t get a lot of attention from investors. They can only be developed in places with appropriate geography (big rivers for hydropower, volcanic activity for geothermal power) and many projects are state-run. Toronto-based Brookfield Renewable Partners (NYSE: BEP) is one of the oldest renewable energy companies in the world. It traces its history all the way back to the 1890s, when it helped electrify the Brazilian cities of Rio de Janeiro and São Paulo with its hydroelectric projects. Today, the company operates more than 200 hydroelectric power plants across the U.S., Canada, Brazil, and Europe. Its hegemony in the hydroelectric space has insulated it from competition. As a result, it’s an excellent income stock. This $9 billion firm pays an impressive 6.76% dividend, and that dividend looks quite stable. After all, Brookfield has doubled its free cash flow over the last year, and it has only made two dividend cuts since 2000 (both of which were small and temporary). Brookfield Renewable Partners is a leader among private hydropower operators, and Ormat Technologies (NYSE: ORA) has similarly cornered the geothermal industry. The $2.9 billion company recently bought one of its largest rivals — U.S. Geothermal — and now operates more than 100 geothermal power plants across Israel, the Americas, and Southeast Asia. It’s also a fairly well-diversified renewable energy company, with a number of solar plants augmenting its geothermal portfolio. The numbers for Ormat look great, too. Assets almost double liabilities and the firm sports a healthy 11.5% return on equity. It also pays a modest-but-stable 0.93% dividend at a comfortably-low payout ratio. The dividend accounts for less than 18% of earnings per share. This last “renewable energy” source technically isn’t renewable; natural gas is a fossil fuel with a limited supply, just like oil and coal. However, natural gas is often lumped in with renewable energy sources for several reasons. For one thing, there’s a lot of natural gas on this planet — about 7 quadrillion cubic feet (that’s 7 thousand trillion) according to the U.S. Energy Information Administration. For reference, OPEC estimates that the world has about 8.5 trillion cubic feet of oil reserves. So natural gas is about 820 times more abundant than oil. 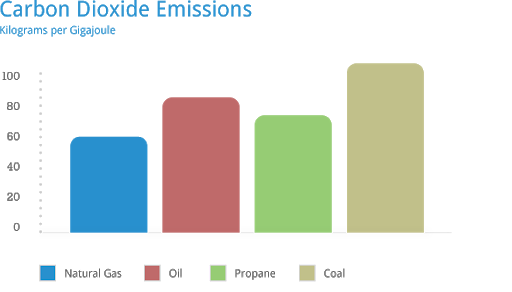 For another, natural gas has a much lower carbon footprint than other fossil fuels. Burning it releases about 50% less carbon dioxide per gigajoule than coal, and about 33% less than oil. Most importantly, true renewable energy sources, like the ones discussed above, aren’t yet abundant enough to power our society. We’re probably going to need natural gas as a “bridge fuel” in the coming decades to keep ourselves from burning too much coal and oil. A recent report from the Center for Sustainable Energy, an environmentalist think-tank, opened with a clear endorsement of this idea. “Natural gas has a significant near-term role to play in helping us reduce reliance on coal-fired electricity and smooth the transition to intermittent renewable sources such as solar and wind,” the report states. In other words, natural gas is almost like a renewable energy source. We have a mind-blowing amount of it left to use, and it burns cleaner than any other fossil fuel. There’s just one problem with it: As a gas, it’s very difficult to transport. People don’t like living near gas pipelines, and building them across the ocean would be prohibitively expensive. In recent years, however, engineers have found an ingeniously simple solution: chill the gas until it condenses into a liquid. That reduces its volume 600-fold, allowing it to be moved around the world in tanker ships. In this section, we’ll be profiling two income-generating limited partnerships that operate in the liquefied natural gas (LNG) technology space. These companies offer much purer plays on natural gas than the big energy majors. Yield co Cheniere Energy Partners LP (NYSE: CQP) was formed by Cheniere Energy to own and operate the massive Sabine Pass LNG terminal in Louisiana. This terminal is one of the busiest in the world — it connects America’s natural gas producers (and consumers) to international shipping routes via the Gulf of Mexico. And it has literally paid dividends for shareholders. Big ones. The partnership’s 5.21% yield accounts for about 80% of earnings per share. Ordinarily that would be a bit high for our liking, but it’s actually rather low for this kind of energy LP. It has never cut its dividend. And the solid earnings growth of its parent company should keep that dividend safe for years to come. GasLog Partners (NYSE: GLOP), ultra-high-yielding partnership, was formed by GasLog to own and operate the 14 tanker ships which carry its LNG around the world. Despite being a relatively new company, it already has several big names among its customer base, including Cheniere — the parent of our other LNG partnership — and Royal Dutch Shell. The partnership’s 9.34% dividend has grown more than 40% since its inception, and it has never been cut. The company has $140 million in cash and a growing customer base that should keep the dividend on the up-and-up. The twelve companies we’ve profiled above are likely to play a vital role in reducing greenhouse gas emissions in the years ahead. And they should make their shareholders — including new Wealth Daily subscribers like you — very happy in the process. But let’s consider a bigger picture question: Are the efforts of these companies going to succeed in keeping emissions-related climate change below catastrophic levels? You see, climate scientists have been warning us for years that we only have a limited amount of time to stop global warming. Climate change (and its cousin ocean acidification) are starting to cause die-offs of plant and animal life in a variety of fragile ecosystems like wetlands, oceans, and tundras. The problem is, all these dead plants and animals release methane as they decompose, which is itself a potent greenhouse gas. With every passing year it looks increasingly like we are going to cross that point of no return. The Paris Climate Agreement is only three years old, yet the U.S. has already pulled out, and many of the remaining signatories are already way behind on meeting their emissions reduction targets. If we fail to get emissions under control — and we probably will — then our only hope may be to keep our emissions out of the atmosphere using carbon capture and storage (CCS) technology. But whatever you call it, the basic idea behind CCS is to stop climate change by chemically or biologically removing greenhouse gases from the atmosphere. CCS allows us to seal up those gases in containers and bury them somewhere they can’t do any damage. Some biomass-powered forms of CCS technology can do more than just neutralize emissions. 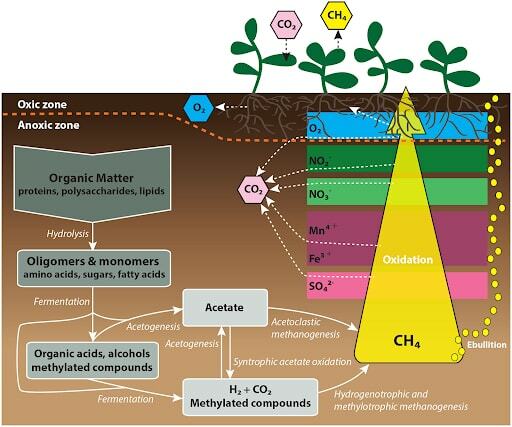 Techniques which use carbon-eating plants and microbes can actually produce negative emissions by pulling existing greenhouse gases out of the atmosphere. And this might be our only shot at stopping a truly disastrous level of climate change. So how can you invest in CCS technology? Unfortunately, it ain’t easy. There are a few companies that are purely focused on CCS technology — but most of them are private startups. Several energy majors, like Shell and Chevron, have CCS projects in the works. But these CCS projects account for a small fraction of these firms’ total operations. And besides, it’s a bit silly to invest in a climate change solution through companies which are massive contributors to climate change. Our research team just discovered one small, publicly-traded company that is mainly focused on CCS development. It’s a perfect way to get exposure to this crucial technology, and it’s got an excitingly-robust set of financials to boot. We’re still finishing up the report, but stay tuned for more info on this rare CCS pure play in the next couple of weeks. As a Wealth Daily subscriber, you’ll be notified as soon as it’s ready.